Recycled Elastomer Market « Global Market Insights, Inc. Increased utilization of recycled materials by manufacturing and infrastructure segments has boosted the global recycled elastomers market, enabling the formation of low-cost and good quality composite products. High elastic deformation combined with exceptional vibration and noise dampening properties have created a wide application base for these materials for improving work environments and transportation networks. Growing awareness among producers around the world for undertaking eco-friendly waste disposal initiatives to reduce pollution caused by landfills has invariably promoted the recycled elastomers industry. Consumers, wanting to ensure that they contribute towards saving the environment, are increasingly accepting and demanding products which incorporate recycled ingredients. Subsequent rise in recycling activities of waste like tires and other rubber products to make building composites, agricultural sheds, artificial playgrounds and auto parts has tremendously propagated the recycled elastomers market, which in 2017 garnered a global revenue of over USD 2.5 billion. Several durable products using recycled elastomers are manufactured depending on the properties most suitable for a particular use in any of the industry segments, such as chemical resistant gloves or athletic turfs for sporting events. In terms of large-scale applications that benefit a varied demographic over time, transport infrastructure has sprouted to become a leading source of revenue for the recycled elastomers market. As compared to traditional paving materials, modified asphalt mixed with recycled rubber allows for a high performance solution to extend the lifespan of roads and highways. Asphalt binding with recycled elastomers, mostly sourced from scrapped tires, provide a safer, eco-friendlier and less expensive alternative. The excellent elasticity and dampening features of such asphalt help to reduce the occurrence of surface cracking, temperature fluctuations and movement caused by traffic loads. The lowering of waste by recycling scrap tires, along with a continuous and reliable raw material supply have strengthened the recycled elastomers market stance within the infrastructure segment. The Asia-Pacific (APAC) is known to be a rapidly developing region with countries like China, India, Malaysia and Indonesia showing remarkable progress in infrastructure spending. In China, for instance, the total road length increased from 3.7 million kilometers in 2008 to 4.8 million kilometers by the end of 2017, while the total length of highway reached a figure of 136,500 km during the same period. The large transportation infrastructure indicates the growth potential of the recycled elastomers market from asphalt binders. As the population and consequent automobile consumption in APAC countries is expected to rise at an incredible pace, a surge in government expenses to develop road connectivity will further encourage recycling initiatives, fueled by an incessant supply of waste rubber materials. It is observed that building a single lane pavement of one mile, 500 to 2,000 scrap tires need to be recycled, presenting the advantage of the recycled elastomers industry in cutting down on land pollution. Use of recycled elastomers in manufacturing agricultural equipment and flooring has additionally maintained the dominance of APAC in the recycled elastomers market, holding over 50% of the global share in 2017. The region encompasses some of world’s leading agri-based developing nations that need constant supply of food and livestock products to cater to an exponentiating population, creating a demand for weather resistant products that support agriculture productivity. For example, India is the second most populated country in the world and as of 2015 had approx. 60.4% of overall land under agricultural occupation. Advancing technologies associated with increasing the crop output have been buoyed by robust water hoses, belts, sheds, windbreaks and vegetation protecting equipment made from recycled elastomers. The recycled elastomers market has experienced prolific returns from the demand for livestock mats as well, derived from the fact that APAC has major dairy and meat producing nations. Stalls and floors housing livestock need to be able to counter weather abuse and seasonal wear, requiring them to be built of durable and flexible materials. Agricultural mats made using recycled elastomers offer a mix of strength and softness that is necessary for safe sheltering of livestock animals, ensuring an up thrust in the total yield. With agricultural income forming a significant part of GDP in China, India, Thailand and other South East Asian countries, the recycled elastomers industry is deemed to witness enormous proceeds from the agriculture segment. All in all, use in infrastructure and agricultural areas due to vital properties like elasticity, durability, UV and chemical resistance, among others have propelled the recycled elastomers industry, with American Tire Recycling, GRP Ltd., West Coast Rubber Recycling, Liberty Tire Recycling, Genan Holding, J. Allcock & Sons Limited, Klean Industries and Emanuel Tire Co. being some key market contenders. 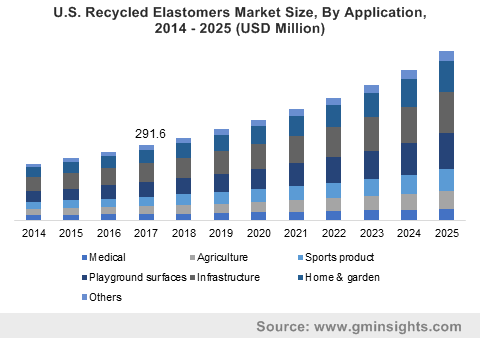 Additional applications such as developing medical devices in combination with FDA approved raw materials will generate supplementary earnings for the global recycled elastomers market, anticipated to register a CAGR of more than 12% from 2018 to 2025. This entry was posted in Bulk & Specialty Chemicals and tagged Agriculture, Chloroprene Rubber, Global Recycled Elastomers Market, Infrastructure, Medical, Natural Rubber], Nitrile Butadiene Rubber, Playground Surfaces, Polyurethane Rubber, Propylene Rubber, Raw Material, Recycled Elastomer Market, Recycled Elastomers Market, Recycled Elastomers Market Growth, Recycled Elastomers Market Report, Recycled Elastomers Market Size, Sports Product, Styrene Butadiene Rubber.